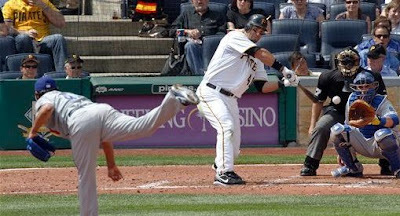 The Pittsburgh Pirates started the 2010 season on the right foot, crushing the 95-win Los Angeles Dodgers by a final count of 11-5 at PNC Park. The sellout crowd of 39,024 at PNC Park was the fourth-largest in the stadium's history. OF Garrett Jones was the story of the day, with two home runs and three RBI in his quest to prove that his 2009 season was no fluke. The Buccos, using a lineup with pitcher Zach Duke in the 8th spot, belted Dodger starter Vincente Padilla for six hits, seven runs, and two home runs in four 1/3 innings. They also got a double, home run, and three RBI from catcher Ryan Doumit and a three-run pinch-hit double from Ryan Church to pace the offense. Duke limited L.A. to two hits over five innings, and five Pirate relievers managed to keep the team's 8-2 fifth inning lead mostly intact, save for a Manny Ramirez-led three run Dodger 7th. The Pirates have gotten off to good starts in the past and we all know how those seasons have ended; but there's no law that says fans can't at least celebrate a nice win over a playoff team on a picturesque day in the Steel City. The two teams meet up again on Wednesday night, with Clayton Kershaw and Ross Ohlendorf taking the mound for their respective teams at 7:05 PM ET. I always have wondered how a game can be a sellout, and not have the largest recorded crowd? Wouldn't it at least tie the largest crowd? Sellout means all the physical seats were sold. I would assume it would be based on the number of standing room tickets that have been sold. John Russell, baseball genius. My public cynicism is working so far...let's see how far we can ride this thing. The Pirates have been looking for a left-handed bat since, oh, I don't know...1992. Garrett Jones, I'm either going to be building a shrine to you or hanging you in effigy...yes, there is no gray area there. The Pirates should raise tickets now before the real team shows up. 80 more wins to go boys! Garrett Jones & Doumit hitting well is nice, but the pirates will need some hitting from Clement, the other LaRoche, and Milledge to do anything this year. ...And Doumit needs to stay healthy.